Just 30 days after rolling out the Island Green smoothie—a mix of spinach, kale, pineapple, mango and banana—the drink became Tropical Smoothie Café’s No. 1 seller. “It continues to be our best-seller,” says CEO Mike Rotondo. In fact, its sales are 50 percent higher than the No. 2 smoothie, the Avocolada, an avocado, pineapple, spinach, kale, coconut and lime blend introduced last year. When the Smoothie King chain debuted Veggie Blends smoothies in 2014, Apple Kiwi Kale rose to the top; since then, it has become the third best-selling out of 70 smoothies on the menu. 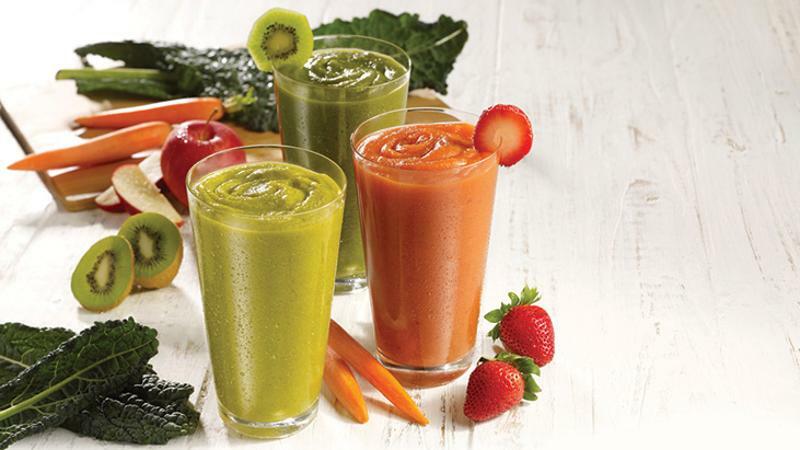 For breakfast-and-lunch chain First Watch, vegetable-based juices, such as its Surprise and Shine blend of watermelon and beet, have had a “huge positive impact to the bottom line” since their launch in January 2015. So where can vegetable-based beverages go from here? Big chains searching for the next “it” ingredients may find the answer in smaller, independent juice shops across the country. There, alternative vegetables, spicier fusions and vegan proteins have long been differentiating juices and smoothies and driving sales. At Harlow in Portland, Ore., the Tempest Smoothie is a blend of mango, spinach, avocado, coconut oil, dates and cayenne. Butcher’s Daughter in New York City offers the Hangover Killer, which includes coconut, pineapple, yuzu, chili and cilantro. And the cold-pressed juice menu at Juice Bar’s three locations in Dallas plays up cayenne, jalapeno and turmeric in its ingredients list. While yogurt blends always will dominate on smoothie menus, both Tropical Smoothie Café and Smoothie King are finding traction in offering more vegan proteins. “When we introduced the Veggie Blends, we kicked off an avalanche of new vegan products,” says Smoothie King’s LeBlanc. Its vegan offerings use almond milk as well as less mainstream smoothie ingredients, such as raw plant-based protein, super grains and cocoa. Introduced last fall, “they were a runaway hit,” says LeBlanc. “The product was so successful and the trend [continued to grow], so we launched a line extension six months later [in March 2015] with our Nutty Super Grain smoothie.” Adding almond milk as a SKU has another bonus—it expands smoothie options for dairy-allergic customers.